If your home has been devastated by fire or flood and requires remodeling or rebuilding, you may be wondering how these processes work. How does a home rise from foundation to finish after crisis? The following explains the purpose and construction of concrete slabs, which provide the first layer of your home’s foundation. Have questions? Call us! We’re glad to help with all of your remodeling and restoration projects. Foundational systems of most homes are made of one of three components: slabs, basements, and crawl spaces. If you live in a coastal flooding area, your home may be raised up on posts. The slab is a flat pad made of concrete that has been directly poured onto the ground. This part of your foundation requires little preparation or framework to install. Concrete slabs are best used in warm or moderate climates, as ground freezes in winter can contribute to shifts in the slab and icy cold flooring. The majority of the slab is between four and six inches thick, with a four or six-inch layer of gravel remaining below. In order to keep moisture out, home builders place a sheet of plastic that is four millimeters thick between the gravel and the concrete. They then embed a six-inch by six-inch wire mesh layer in the concrete, visible as a dotted line in your slab, as well as steel reinforcing bars, which show as white circles at the bottom of the beams. Inside the slab, your home’s sewer pipe is secured, as well as some of the electrical conduits for the house. Both the pipe and conduits must be secured before the concrete is poured, as they may become embedded in the concrete. Slab leaks can occur in one of two ways. 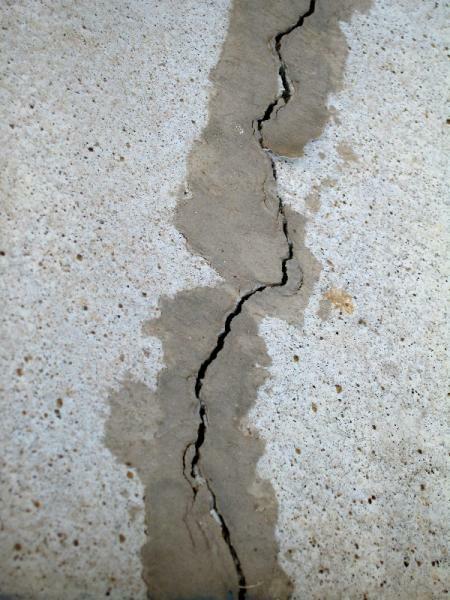 If your foundation cracks during a natural disaster, including an earthquake, heavy storm, or flood, or due to intrusive force from tree roots, your slab becomes vulnerable to interior flooding. Interior moisture can slowly weaken the slab and provide a nesting ground for mold and mildew, both of which can lessen the integrity of your home and contribute to sloping flooring and reduced wall stability. Slab leaks can also occur due to corrosion and abrasion of or pressure on embedded plumbing pipes. Any of these factors can wear the pipe down to the point at which it cracks and begins to leak water into an enclosed space, welcoming mold, mildew, and structural issues. Restore Right is well-equipped to repair any leaks in your foundational slabs. If you suspect that issues with your flooring, walls, or plumbing lie deep in your foundation, call Restore Right today or visit us online at www.restoreright.com! Understanding the way your foundation is built is essential to your ability to detect leaks where they originate. In Part Two, we’ll cover how basements are constructed and the issues that may arise over time. What’s the Best Time of Year for Home Remodeling?